Visited with lots of people today, so only got in 46 miles, but that’s okay. It’s why I’m riding. Cruising up the frontage rode to Interstate 55 on the way to Springfield, saw a large single wind turbine and rolled down a gravel road to get a closer look. Discovered that the Gob Nob Wind Turbine sits right on top of the former Crown coal mine! Could not have a more fitting site to be generating green energy for the people of Illinois. 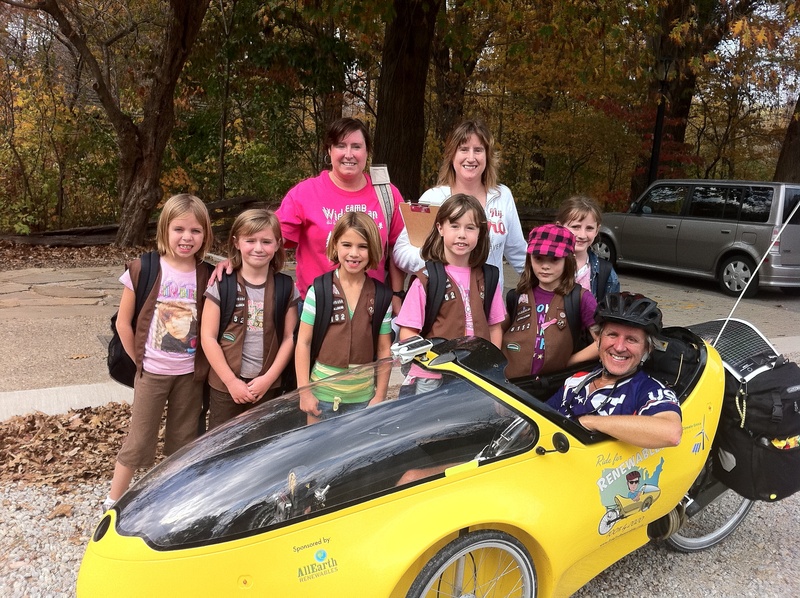 Later riding along the shores of Lake Springfield, some members of Brownie Troop #6152 from Rochester, IL shouted out to me as I was pedaling by, so I stopped to talk to them and shared with them what I was doing. They really liked the trike. A little later, ran into Ric Mari and his family, from Springfield, who shared with me how decades ago, the California community he lived in was going solar. What happened? Was keeping my eyes on the Dallman coal plant looming over the shores of Lake Springfield, in the hopes of getting up close for a picture. Rode down one street, but it was a dead end. Another was a residential neighborhood with no lakeside access. Saw a couple working in their front yard with Journey blasting on the radio, so rolled up to ask if I could take a picture from their backyard. Tom Hnizodo and Terri Dickson-Hnizdo not only let me take some pics of the plant, but offered me their guest suite for the night. Was later treated to a BBQ dinner with Tom on their back deck, where irony of ironies, we talked about his former job as a Wyoming coal miner, with giant smokestacks belching out emissions not more than 200 yards away. The stories he shared on what it was like mining underground were mesmerizing, and otherworldly. What a mysterious journey life is, made all the more wonderful when you meet people like this. Later did a little research on the coal plant across the water and learned that the Sierra Club had settled a lawsuit allowing the construction of a new power plant with the lowest pollution rates in the nation; the purchase of 120 MW of wind power; closure of the Lakeside power plant (the #3 dirtiest plant in the country); increasing energy efficiency funding 10-fold; and cleaning up three other coal boilers to the lowest SO2/NOx emission rates for existing boilers nationwide. 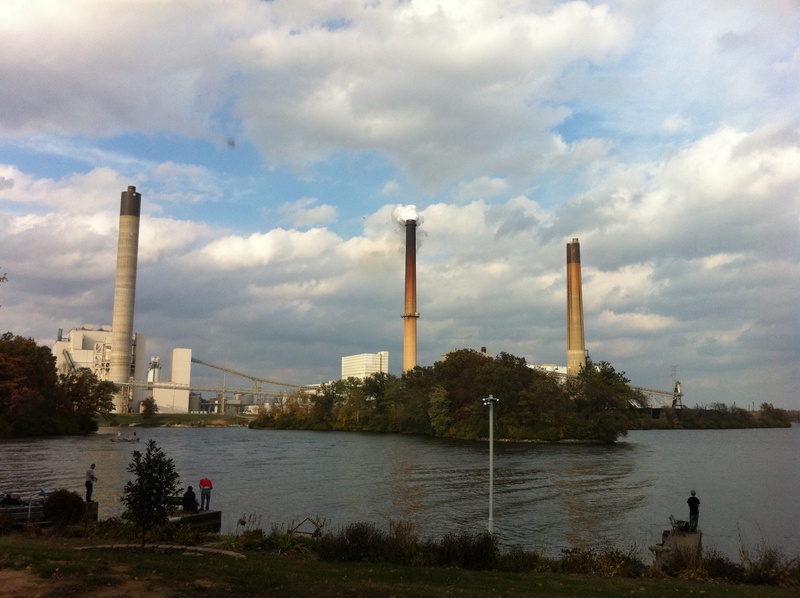 Better than nothing, for sure, but we don’t need less polluting coal plants in our communities. It’s time to move beyond coal completely. I look forward to visiting Tom and Terri again, not too long from now, when that coal plant stands as a museum for how we used to do things. This entry was posted in 2010 Ride, Blog, Video and tagged dallman coal plant, gob nob wind turbine, ride for renewables. Bookmark the permalink.